Dubai, UAE, July 16, 2018: The DS Podium is a well-known and quite popular face in the CERTINA line-up. The highly accurate PrecidriveTM quartz movement in the new DS Podium Chronograph brings even greater precision to the product line, with a few exciting variations, for added sportiness. 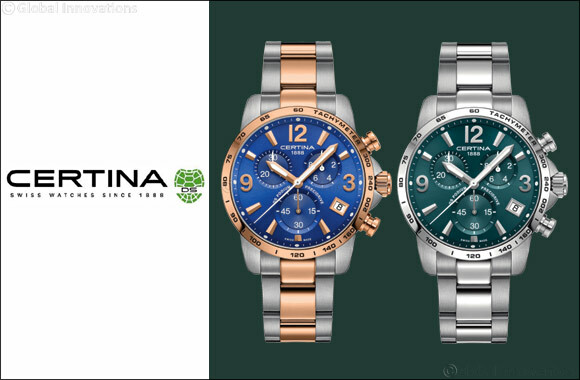 The strong character of the CERTINA DS Podium Chronograph is instantly recognizable. From the earliest days of the product line, its sporty personality struck a chord with active individuals, instantly drawn by its large numerals, contrasting elements, polished bezel and bold design. Now with a Swiss Made ETA PrecidriveTM movement inside its brushed all-black PVD-coated 41mm case, it takes its sporty nature to a new level. The ultra-precise (+/- 10 sec./year) quartz chronograph movement provides 60-sec., 30-min. and 1/10-sec. timing (in real time and visible during the first minute), as well as the standard H, M, small second and date, protected by a sapphire crystal with anti-reflective coating. The DS Podium Chronograph is assembled using the renowned Double Security Concept, as evidenced by the presence of the initials “DS” on the tip of the protected crown, and the timepiece sports a beautiful, embossed CERTINA turtle emblem on its case back. Now available at Rivoli and Hour Choice stores across the UAE, the silver metal strap timepiece is priced at AED 1,890 while the timepiece with gold-silver metal strap timepiece is priced at AED 2,130.